McCulloch chainsaws are designed for following forest service: limbing, felling and cutting. Chainsaws are highly dangerous equipment and if not used properly or if used when damaged they can cause very serious injuries or death. You should never use the equipment when tired or while under drugs or alcohol influence or even certain medication. Personal protective equipment should be worn at all times. Following safety equipment should be used when working with McCulloch chainsaw: hearing protection, protective helmet, goggles , trousers with saw protection, gloves with saw protection, boots with saw protection. First aid kit should always be somewhere close as same as fire extinguisher. The only and best way to avoid kickback is to ensure that the kickback zone of the bar doesn’t touch something. Most McCulloch models have kickback reduction ”built-in”, but you need to make sure that the chain is sharp and well maintained. 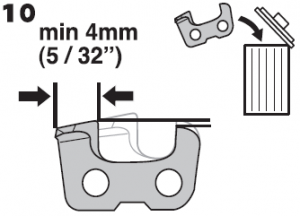 You need to replace bar that is damaged, worn or in other instances bar together with a chain or/and chain combinations for those which are normally recommended by Husqvarna. Also the smaller the tip radius the lower the chance of kickback. 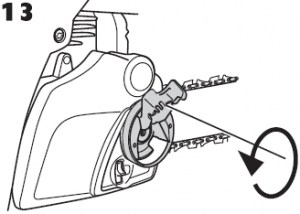 All McCulloch chainsaws have an automated chain lubrication system, however some models allow additional oil flow adjustment. In McCulloch chainsaws fuel runs out before the saw chain oil, whenever there is enough fuel and chain oil the the tanks. The carburetor is recommended: if you see that the mixture is lean- that means that the fuel lasted longer than oil. Chain lubrication should also be verified each time you refuel. The tip of the bar should be aimed at a light coloured surface around 20 cm away. 1 minute later you should run your chainsaw at 3/4 throttle and then you see light line of oil on the light surface. If that is not the case you will need to verify if there is no obstruction at the oil channel present in the bar, alternatively you will need to verify that the edge of the bar is clean. When after cleaning all mentioned before chainsaw is still not working properly you should take your equipment into the nearest McCulloch service station. The spur sprocket is fitted in the clutch drum. During the everyday maintenance works you should verify if is it worn on the drive sprocket. Whenever wear is excessive it should be replaced. Other example when it always should be exhcanged is the chain replacement. Guide bar condition should be checked regularly. Primal reason to check is to find if on the edges of the bar there are burrs (A). If you recognize those you will need to use file to remove those as shown on the picture number 17. In instances when you observe badly worn bar groove (B), the whole bar will need to be replaced as shown on the picture number 17. In instances when the bar tip is worn or uneven and a hollow forms on the tip bar underside you will need to replace not only the whole bar but also tension or/and replace the chain. Put the chain brake over and find the chain adjuster pin, verify if all drive links of the chain fit correctly. Re-tension the chain by turning the wheel down until it does not sag from the underside of the bar as shown on the picture number 14. 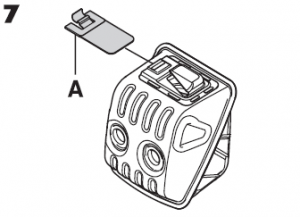 Hold up the bar tip and tighten the bar knob by turning the knob clockwise as shown on the picture number 15. When dealing with a completely new chain you should check it in a daily basis. Each McCulloch chainsaw is equipped with a two-stroke engine. Two-stroke engines run using a mixture of two-stroke oil and petrol. It is very important to accurately measure the amount of oil to be mixed, because even small differences in mixing ratio will highly affect chainsaw performance. You should always remember about mixing the petrol and oil in a clean container that is used only for this purpose. Good practice is to start with filling half of the needed amount of the petrol to be and then adding the oil. The whole mixture should be shaked carefully and only then you should pure it into the machine. Never mix more than amount needed, and before pouring in the mixture the chainsaw tank should be empty and clean. Under any circumstances don’t use waste oil as it will surely damage chain, oil pump and the bar and the chain. 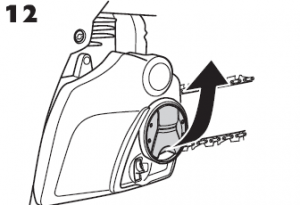 Proper maintenance will long term reduce the risk or chainsaw breaking, kickbacks and will help to obtain normal performance extending your chainsaw life. Remember to always avoid increasing vibration levels. 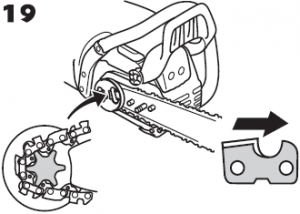 Before chainsaw usage always make sure that the cutting teeth properly sharpened, because not sharp or damaged chain highly increases the risk of accidents and life danger. Verify correct depth gauge setting and keep that chain tensioned at all times. Store the integrated combi-tool in the tool-holder when not in use, use tools recommended by producer. Following service and maintenance should be held at particular intervals. Certain works must be carried out by trained and qualified specialists at the service stations. Verify that nuts and screws are tight. The tree you are cutting should always fell where you can do further cutting on it, so it should be chosen correctly before any cut happens. Once you’ve decided where it should be you must be able to judge which way the tree would fall naturally, that decision should be made on the basis of following factors: lean or bend of the tree, branches arrangement, roots damage, presence of any obstacles within the safe distance, current wind direction or weight of snow if applicable. Most common felling method is the three cuts method. You start with directional cuts- top and bottom and then you finish with the felling cut. 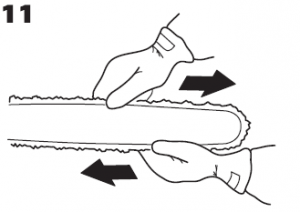 If you do the three cuts correctly you will be able to control the felling direction. It is advised that the directional cuts run at around 1/4 of the diameter through the trunk and 45° angle. The carburetor controls the engine’s speed, and it is done by throttle control. Carburetor regulates the number of motor revolutions through the accelerator. The amount of air and fuel mixture can be adjusted and good adjustment provides best performance. Basic carburetor settings are set during testing at the factory. If you want to adjust the carburetor yourself you should use the T-screw: once is turned clockwise this gives a higher idle speed and when turned anti-clockwise it gives a lower idle speed. 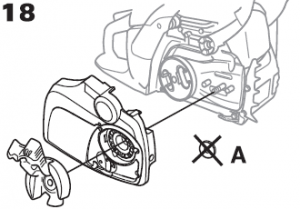 The air and petrol mixing happens in in the carburetor, you can control this process, but air and petrol adjustment must be correct or it will significantly lower chainsaw long life. 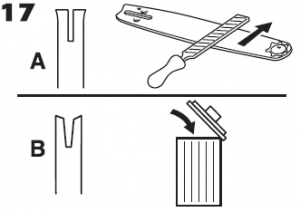 If you want to be exploit the power of the saw you should use T screw (turning it clockwise and anticlockwise as described above). When changing he carburetor setting pay attention to the moving chain, because it can result in injuries. Remember to check if cylinder is in place and air filter is clean before you start to regulate the carburetor. The minimum is properly adjusted when motor turns regularly in every position with certain margin before the chain starts turning. 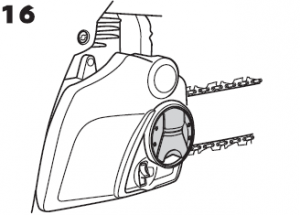 Each McCulloch chainsaw has several safety options included. McCulloch advices to replace muffler every 75 hours of use. 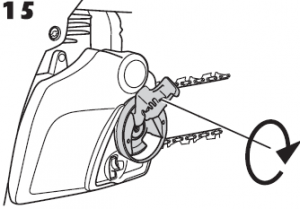 Chain catcher– before using chainsaw you should always verify that the chain catcher is firmly attached to the body of the chainsaw and it is not damaged. Right hand guard- before each chainsaw usage verify that the right hand guard is not damaged. Check for any visible defects as cracks, if observed don’t use your chainsaw, but take it to the closest service shop. 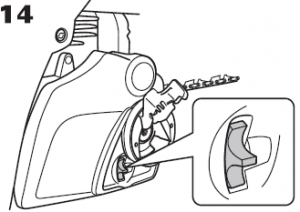 Spark plug- in instances when your chainsaw is doesn’t want to start, low on power, or doesn’t run well at idle speed you should start from verifying the spark plug condition first. The spark plug condition depends from: dirty air filter, wrong fuel mixture (incorrect type of oil or too much of it), incorrect carburetor adjustment. All mentioned result in deposits on the spark plug electrodes. Clean the spark plug when it is dirty, remember that the electrode gap should be around 0,5 mm. McCulloch recommends to replace spark plug should after a month of usage. When replacing spark plug always use spark plug designed for your model only, using of not supported plug will result in piston/cylinder damage. 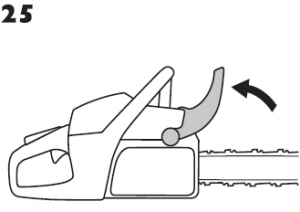 When using your chainsaw during the winter you can experience following issues: Icing of the air filter and carburetor and too low engine temperature. To avoid those you need to partly cover the air inlet on the starter and that will allow to rise engine temperature, you can also purchase special winter cover that is mounted on the starter housing. Cover should be used only during the winter conditions and then needs to be removed because it will cause overheating the engine and will damage it.